It is finished. We now have our Summer League of Legends champions. After fending off competition from 38 other teams in a grueling 7 week long tournament, our 2015 Summer Champions are Huddersfield White. It wasn’t just the Grand Finals which went down this weekend, we had to have the semifinals first (obviously) to cut down four teams to two. 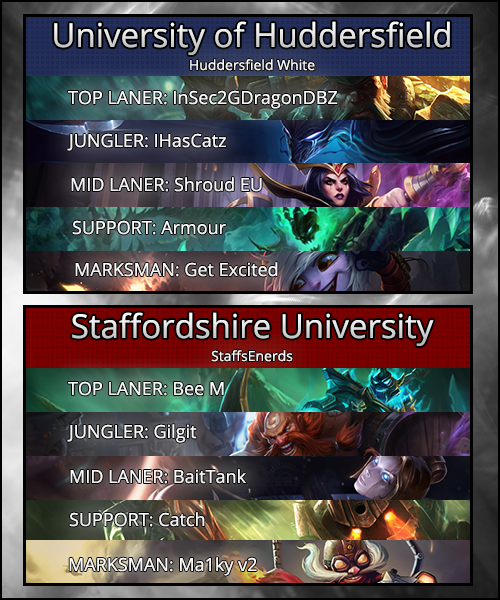 The first was a match between Amir is Toxic (from Birmingham City University) and the winners of the wildcard tournament, the StaffsEnerds (from Staffordshire University). The games were streamed and VODS are now up on our new YouTube channel for VODS. With the teams splitting the first two games between them and the series being tied at 1-1, it was down to the final game to decide who advanced to the finals. In the end, it was clinched by the Wildcard winners: the StaffsEnerds. The second semifinal was between We are feather feather getting back together and Huddersfield White. Despite the team from York being from the top of the Championship Table it was Huddersfield White who took a resounding 2-0 victory and booked their place in the finals. I doubt I’ll be complaining at not having to type out We are feather feather getting back together again either. Ok, so maybe I had to write the absurdly long team name once more, but now I’m done. Anyway, now it’s time for what you’ve all been waiting for; what happened in the final? It would have been positively greedy to ask for a better Grand Final. It was a best-of-five and we got all five games. Both teams were pushed to their absolute limits and we even got that most glorious treat: a reverse sweep. Then they went and lost the first two games of the series. Now at this point I was half expecting a fairly tale underdog story from Staffs. I have a theory that when a team is 2-0 up in a best-of-five, if they lose the next game then, because of the momentum swing, they are more likely to end up getting reverse swept than win. If anyone wants to crunch some numbers for me, be my guest. Regardless, from going 2-0 down, Huddersfield White turned it around and won 3 games in a row for the win. Game Three was the key game in the series, it was the closest and it was where they turned it around. Here’s how it went down. The game went into a standard lane start, after a 5-man invade by Staffs was scouted out. The only early discrepancy was top laners taking jungle. Bee M on Hecarim duojungled with Gragas for Gromp and Blue while Gangplank took Raptors. Both then teleported to lane. Firstblood went down at 4 minutes into the game. Shroud EU on LeBlanc hit her Ethereal Chains skillshot onto BaitTank’s Orianna which let Nocturne gank for a kill. After this Nocturne headed to bot lane for another kill, this time on Ma1ky v2’s Corki. Simultaneously InSec2GDragonDBZ on Gangplank solokilled Hecarim in the top lane. When all the dust settled, Huddersfield were 3 kills up and 1.5k gold in the lead. Gilgit on Gragas got his first successful gank 7 minutes in, combining with Hecarim to kill Gangplank in top lane. However Huddersfield were quick to reply. Get Excited on Tristana baited out a hook from Nautilus (played by Catch). This let Nocturne gank and kill the Nautilus while she escaped on low health. Bot lane must have been feeling confident from this; 9 minutes in Armour’s Thresh hit a hook onto Corki. The problem there was that Corki was full health, Thresh was half health and Tristana was even lower. Despite this Thresh reactivated the skill and pulled Corki in. The instant Thresh’s crowd control wore off Corki blew up Tristana with a Phosphorus Bomb, Thresh nearly escaped but was chased down and killed by a fade away Depth Charge from Nautilus. Immediately the camera panned top as Gragas ganked there again, but a perfectly timed Flash by Gangplank caused the Explosive Cask to push him to safety. Even better, Nocturne arrived to countergank and picked up a double kill. Nocturne’s counterganking was on point this game, he set up to do it again bot lane at 12 minutes. At this point he was two levels above Gragas, but because of Corki’s early power Staffs picked up two kills when the 3v3 goes down. It didn’t end there though; LeBlanc arrived as Gangplank teleported down and they picked up 2 kills between them in exchange for LeBlanc’s life. Hecarim’s teleport comes in late and though he damaged everyone remaining they escaped to turret safely. Overall the fight was 4v5 (with Orianna staying and pushing mid lane) but Staffs ended up with 3 kills for 2. Things went even better in the aftermath. Gangplank and Tristana both stuck around greedily on low health. Hecarim redeemed himself for the late teleport by sneaking around to tribush and flanking them just in front of their turret. Tristana died instantly and he chased down the pirate for a double kill. Meanwhile, remember I said Orianna stayed mid? Well she also picked up first tower of the game. With the dust settling from that fight and the first turret dropping the game moved into mid game. Hecarim was up 2 kills but down 15cs top lane. Nocturne was up 3 kills AND up 15cs on Gragas (his Devourer was on 13 stacks). In the mid lane Orianna was up 30cs and had taken the turret, but LeBlanc had 2 kills. In the bot lane Corki was up 25 cs (and approximately 5 Targons stacks) and 2 kills. Even Nautilus had a kill whilst Thresh didn’t. Overall, Staffs were up 1k despite going down 3-0 in kills at one point. At 14 minutes Corki had his Trinity Force and the spike that comes with it. He tried to make use of it in a 2v2 bot lane but it wasn’t 2v2 for long as Nocturne arrived. Thresh escaped the Corki on very low health but Corki didn’t escape Nocturne. Tristana and Nocturne then chased Nautilus up the river. With assistance from Gangplank’s Cannon Barrage’s slow they caught up and killed him, despite Gragas’s intervention. This closed the gold gap. Immediately afterwards, Huddersfield White opened up their own gold lead when LeBlanc solokilled an Orianna who had foolishly stuck around on half health in mid lane. However, this minimal lead swung right back at 16 minutes. For once the StaffsEnerds bot lane got a fight without Nocturne there to gank. In a near repeat of earlier, Thresh questionably engaged and dies for it. Tristana just escaped but the turret went down followed by an uncontested Dragon for Staffs. The StaffsEnerds had taken two turrets now and finally Huddersfield pick up their one for themselves, with Gangplank taking top lane down. Meanwhile, a skirmish was happening in mid lane. He dropped his Cannon Barrage there but both sides escaped without losses. Gold was completely even at this point. The same can’t be said a minute later. A Thresh hook onto Orianna (with LeBlanc and Tristana in range) led to her death under turret. She died again after another minute, getting caught clearing wards in river by Nocturne’s ultimate, Gangplank’s ultimate and LeBlanc jumping in from galaxies away. Despite this the Staffs mid lane turret obstinately still stood. At 21 minutes, Hecarim responded to Gangplank abandoning top lane and took the Huddersfield turret down. This shrunk the gold lead to a mere 1k in favour of Huddersfield. A minute later, Staffs got their second Dragon with Huddersfield too slow to contest. Staffs immediately rotated mid to stop Huddersfield pushing mid turret down and won the ensuing 5v5 fight with 4 kills to 2. This included a skillful, blind missile-snipe by Corki onto a fleeing Tristana in fog of war. Gold returned to completely even with Corki and Hecarim at the height of their mid game power spikes. Following this, things quietened down until 27 minutes. Tristana traded her life for mid turret and with all the turrets down the game entered the lategame. At this point, Huddersfield’s superior scaling will soon take effect. Corki and Hecarim had now passed their peak with Tristana and Gangplank continuing upwards. Nocturne is simply so far ahead of Gragas he won’t be dropping off anytime soon (don’t forget Devourer either). LeBlanc may be down nearly 80cs on Orianna in mid but having way more kills and assists will keep her even on scaling. Despite this, Staffs will always have a chance to win fights due to their teamfighting combo of Hecarim and Orianna ultimates with Corki bombs layered on top. The Huddersfield composition is very squishy so pulling this off would be devastating. Having said that, Orianna’s ultimates have been relatively lacklustre this game. Mostly I would attribute this to the fact that Nocturne nearly always dives onto her with his ultimate. This forces her to shield herself with her ball and use everything to try to peel him. To put it another way, the teams have been trading punch for punch all game. The longer it goes on the better it looks for Huddersfield but Staffs will always have the possibility of a knockout blow. After nearly 5 minutes of quiet farming and the game still even, it seemed that both teams were somewhat unsure about what to do next. Neither had enough of an advantage to be able to take the initiative for Baron or tier 2 turrets. So they aimed for smaller objectives and danced gingerly around each other. At 28 minutes Staffs invaded Blue Buff and found a kill on Thresh. The rest of Huddersfield disengaged safely, but Staffs didn’t feel comfortable going for more. Another Dragon spawned at 29 minutes, forcing a fight around it. The fight went 2 for 2, gold was STILL even and the killscore was 17-17. A minute later Staffs committed for the Dragon and took it, their third, while LeBlanc tried and failed to steal. The 3-0 Dragons were about the only thing separating the teams at this point. A minute later Nautilus got caught in river warding by Baron, and then again in the mid lane too far up from his tier 2 turret. Huddersfield were now playing more assertively and slowly growing a gold lead purely from map control. 34 minutes into the game a 4v4 fight began from a Nautilus hook onto Tristana in the mid lane. It grew to a 5v5 as Corki and Gangplank arrived late. Overall it was a 3 for 1 in Huddersfield’s favour and they then took mid tier 2 turret and held a 4k gold lead. A few minutes later the Dragon spawned. Once again Staffs were in position; they took their 4th Dragon and safely avoided an engage. Five Dragons could be their win condition here if the game continues. At 37 minutes Staffs engaged on Huddersfield in river. Both frontline divers (Hecarim and Nocturne) get melted quickly in 1v4 scenarios and the fight ends in a 2 for 2 with both teams disengaging. However LeBlanc picked up a cheeky kill soon after from Tristana and Gangplank on low health baiting in Corki. Staffs go for a poorly thought out push on mid tier 2 turret at 39 minutes. But Huddersfield instantly engaged by dropping the Gangplank Cannon Barrage behind them and picked up 4 kills without any returned, leading the Baron. They were now 9k up. After all this, the game then ended without a climactic ending fight. Orianna got caught in mid lane by Nocturne’s ultimate. Shortly afterwards Nautilus also got caught in the jungle. This let Huddersfield break into the base and end the game, getting their first win of the series and setting them on the path of the reverse sweep. Rather than just give MVP for the game, this week we are having MVP of the series. That award goes to IHasCatz. In the turnaround game he constantly outfarmed and outganked his opponent on Nocturne and was on point with completely shutting down Orianna all game. In the final, deciding game of the series he had full half of the team’s kills (10) and highest kill participation. So for being a true jungle carry, MVP goes to IHasCatz. That wraps everything up for this recap. Expect an interview with the winners, Huddersfield White soon! When is the next league of legends tournament? The main season should be starting in early November, immediately after worlds. In the meantime there’s likely to be preseason friendlies, dates will be released closer to the time.